One of the great traditions of every NHL season is the rush by some media to hand out an important trophy way, way too early. This season’s example concerns the Calder Trophy race. Elias Pettersson – Vancouver’s 20-year-old superstar – has dazzled the hockey world this season. Through 23 games, Pettersson has 13 goals and nine assists. It is hard enough being a point-per-game player in the NHL, and it’s even harder to do it in your rookie season. Add in the fact that Pettersson is playing on a rebuilding Vancouver team that’s clearly in the shallow end of the talent pool, and you already have a legitimate argument supporting his candidacy. So it’s understandable, to some degree anyway, why so many rushed to engrave his name on the Calder. The problem is we didn’t let the race breathe. 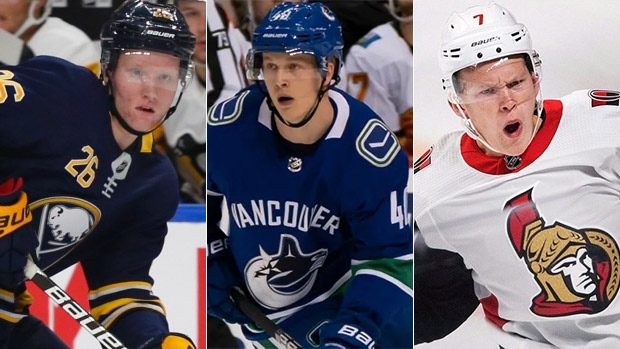 And now that we’ve had some more time, we have at least two other candidates from the Eastern Conference prepared to seriously challenge Pettersson’s candidacy – Ottawa’s Brady Tkachuk, and Buffalo’s Rasmus Dahlin. I alluded to Tkachuk’s candidacy earlier in the week and it was met with some resistance, which I found surprising. Tkachuk doesn’t have the point totals that Pettersson does, but that’s largely because Tkachuk missed a handful of games earlier in the season. On a per-game basis, Tkachuk compares quite well to Pettersson – more on this in a moment. Dahlin is another interesting candidate. Obviously the Buffalo Sabres are the league’s most surprising story this season, and the fact that they are picking up so many wins with a blueline that was utterly shambolic nine months ago speaks volumes. Dahlin has been a major calming presence on that blueline – he is third amongst Sabres defencemen in ice time, but when he is on the ice, the Sabres are generating heaps of offence. So much so that Dahlin is actually third amongst all rookies in scoring, despite playing a position that doesn’t lend itself to accumulating big point totals. Other names may enter in the conversation over time, but right now we’re looking at a three-horse race. I thought it would be interesting to do a side-by-side comparison of the three players, season-to-date. There are three types of measures below – how a player has performed individually, how a team has performed with a player on the ice (“on-ice”), and how much better a team is with a player on the ice versus off the ice (“relative”). Not surprisingly, Dahlin is going to pale in comparison here – a lot of the individual measures tend to involve offensive activity and associated scoring and a defenceman is always going to be disadvantaged to some degree. Conversely, it’s expected that Dahlin would lead the Calder field in ice time. That said, I do think the Pettersson-Tkachuk head-to-head is fascinating. On a rate-basis, Tkachuk has been the better goal scorer and better shot generator at both 5-on-5 and across all situations – and by a pretty considerable margin. Blind to teammate quality, I think Tkachuk, individually, has been the best of the three so far. How you weight the importance of teammates could obviously change that. Let’s move to some on-ice measures. Here we will restrict to 5-on-5 only, if only because variances in special teams’ deployment can cloud our numbers across all situations. Tkachuk shines here in a big way. He sees more shots generated offensively and fewer shots generated defensively, which is a great starting point. But it’s also translating to a decisive goal advantage against the two players. Consider it from this perspective: For every 60-minutes played, the Sabres are 0.8 goals better than their opponents with Dahlin on the ice, and the Canucks are 1.0 goals better than their opponents with Pettersson on the ice. Ottawa is 1.8 goals better than their opponents with Tkachuk on the ice – a massive differential that can’t be waved away. Of the eight on-ice measures here, only two of them go to players not named Tkachuk. Dahlin has seen the lowest goals against (by decimal points over Pettersson) of the three and carries the highest on-ice save percentage. But again, on-ice numbers can’t tell the full story. If we think Pettersson (or any player) is at a sizable disadvantage because of the quality of the teammates they’re playing with, then we must consider relative performance – or how teams perform with/without a given player. As expected, Pettersson looks better when you consider quality of teammate. When teammates play with Pettersson, they see their shot attempts increase by about five per-60 minutes, their goals for increase by about one per-60 minutes, and their goals against decrease by about one per-60 minutes. All three of those measures lead our three-horse race and are worth emphasizing here. The best thing you can say about any player is that he improves the play of those around him, and in Pettersson’s case, that’s true to a large degree. The issue is that there isn’t a big enough gap to completely change our evaluation of the three. After all, Tkachuk has an incredible impact on shots against for his teammates – they enjoy a nearly 20-shot benefit from their normal performance when paired with Tkachuk. And Dahlin improves the shot performance of his teammates by about nine per-60 minutes, which is also decisive. If, by now, you are confused about the Calder Trophy race – well, that’s sort of the point. The reason why it looks like a muddied mess with no clear answer right now is because that’s exactly where we are at. Pettersson has accumulated the most impressive scoring totals in probably the toughest situation. Tkachuk has been the best per-game performer, and on both ends of the ice. Dahlin is crushing his defencemen comparables and is doing so on one of the most successful teams in the league – something that neither Pettersson nor Tkachuk can argue. Long story short: We desperately need to let this Calder race progress. A few weeks into the season, it seemed as if Pettersson would run away with it. But the emergence of Tkachuk and Dahlin has changed the outlook of this race, and assuming the paces hold, I anticipate voting will be tight at year’s end.